（I）Synthetic aperture configuration with 1/4 data acquisition channel. Limited view reconstruction results (II) and enhanced resolution simulation results (III). The photoacoustic images reconstructed by (a) BP with center aperture (b) BP with synthetic aperture (c) CS with synthetic aperture (d) CS with 1/4 synthetic aperture. Fig. III (e) is the profile along the center line on Figs. III (a)-(d). Note: Back projection (BP), Compressed sensing (CS). Photoacoustic tomography (PAT) is a noninvasive and non-ionizing hybrid biomedical imaging modality, which has the unique capability of visualizing optical absorption inside the several centimeters deep biological tissue with high acoustic spatial resolution. It is of great value on clinic as a powerful supplement of traditional ultrasound imaging. However, the single linear array transducer based PAT suffers from the limited view challenge and the resolution is still not high enough in current PAT configuration. 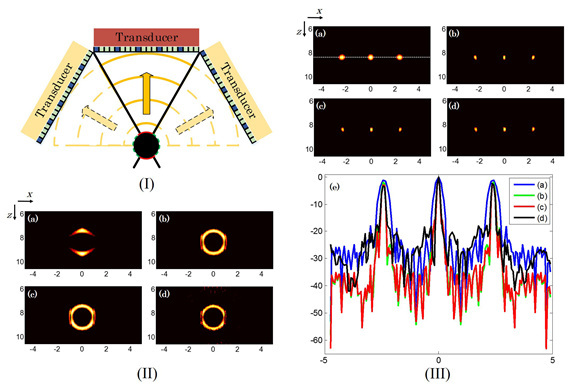 In the recent work, a feasible synthetic aperture PAT based on the compressed sensing reconstruction algorithm proposed by Xiangwei Lin, a Ph. D. student in Associate Prof. Mingjian Sun's lab at Harbin Institute of Technology, has overcome these difficulties without any additional data acquisition hardware. This approach combined the ultrasound spatial compounding method to extend the effective aperture size and the compressed sensing technique to reduce the measurement dataset. Both the simulation and experimental results testified the theoretical model and validated that this approach can efficiently improve the image resolution and address the limited view problem while preserving target information with less number of measurements. This research relies on the synthetic aperture PAT to achieve the multi-view data acquisition to solve the limited view challenge and sparse sampling in the compressed sensing algorithm to recover the target structure of biomedical tissue with reduced measurements. It could provide a potential solution in the clinical transformation to visualize the structure of blood vessel, human breast more clearly and completely with the clinical B-mode ultrasound imaging system. This work is reported in Chinese Optics Letters Volume 15, No. 10, 2017 (Xiangwei Lin, et al., Compressed sensing in synthetic aperture photoacoustic tomography based on a linear-array ultrasound transducer). “The presented work has greatly improved the resolution of PAT system and its potential for clinical transformation by multi-view sparse data sampling and the compressed sensing reconstruction algorithm”, said Associate Prof. Mingjian Sun. In the future study, with the optimized sparse sampling, real time 3D synthetic aperture based PAT for whole-body small animal imaging and clinical feasibility for peripheral vessels and human breast imaging will be further investigated.